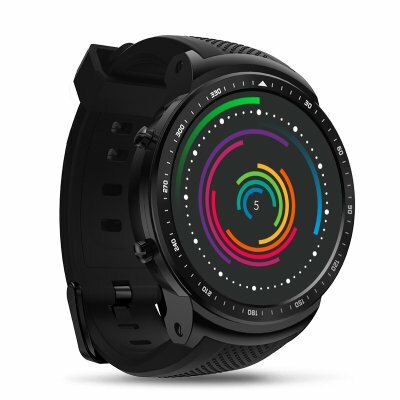 Successfully Added Zeblaze Thor Pro Watch Phone - Android OS, Quad-Core CPU, 1GB RAM, 3G, 1 IMEI, Google Play, 2MP Camera, Pedometer, Heart Rate to your Shopping Cart. Enjoy the latest Android features straight from your wrist with the Zeblaze Thor Pro Watch Phone. This phone watch supports one IMEI number to slide in your SIM card. Once inserted, it lets you enjoy all the regular smartphone features as if it was a normal Android phone. You can make calls, send messages, and even browse the web. Thanks to WiFi and 3G support, this Android watch will keep you connected at all times. The watch features a crisp 1.53-Inch IPS display that comes with corning gorilla glass for extra protection. Thanks to its 500mAh battery, you’ll be able to enjoy all this phone watch has to offer throughout the day without needing to worry about battery life. Packed within its sleek body, the Zeblaze Thor Pro Watch Phone holds a sophisticated Quad-Core processor and 1GB RAM. Thanks to this, you’ll be able to play all basic games and enjoy Android apps without slowing down your device. Via its Bluetooth connectivity, you can even synchronize the watch with your smartphone. This means that you’ll be able to use your phone watch even when you have not inserted a SIM card. For all the outdoor and sports lovers among us, this Android watch comes with a pedometer, heart rate monitor, and GPS navigation feature. It even holds a built-in 2MP camera for snapping pictures and videos on the go. If you’re looking for a high-end yet affordable Android watch, the Zeblaze Thor Pro Watch Phone is the perfect choice for you. This Android watch comes with a 12 months warranty, brought to you by the leader in electronic devices as well as wholesale phone watches..